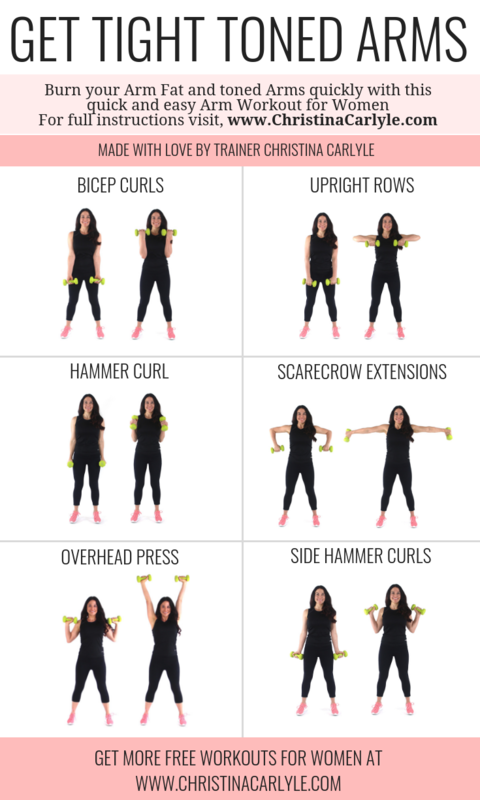 If your arms make you self-conscious, then you are going to love this arm workout for women. It’s quick, easy and works. There are a few reasons why this arm workout perfect for women. First, I designed this workout specifically to help women tighten and tone their arms while burning fat, and avoiding bulk. Over the course of my training career, I’ve found that women was tight, toned arms that don’t feel soft and flabby but they also don’t want arms that aren’t too big and bulky either. 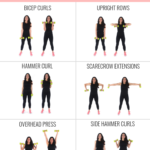 This arm workout works will help you get toned feminine arms and go sleeveless with confidence. Secondly, I designed this workout routine with some of the best arm exercises so you can get results quickly. There are only 6 arm exercises in this workout, but some of the exercises also target your back muscles, too. This way you can increase calorie burn, to burn more fat and build lean muscle. This arm workout only takes about 20 minutes, too. Finally, all you’ll need is a set of dumbbells to do this arm workout. That means you’ll be able to train your arms at home or the gym. You can use this workout routine to train your arms without a gym membership, machines, or spending hours trying to get results. This workout is for busy women that want to burn fat and tone their arms quickly. It works, if you work it. Once you’re done with the workout, leave me a comment and let me know if you felt the burn. I always love hearing what women think about my workouts. After all, everything I do I to help women stop struggling and start getting better results with less exercise and the most delicious food possible. Choose a weight that is heavy enough so that you feel like you’re working… but not too heavy so that you can do the moves with proper form. 5 pounds is a good place to start. Add more weight as you get stronger. Once you’re done with the first exercise, move onto the next. Take little rest between the exercises. This helps boost heart rate so you can burn more fat. Do each exercise 1 time to complete 1 full set or round of all 6 exercises. Do 3 full sets (of all 6 exercises) to complete your workout. If 3 sets feels too easy, add more weight or you can also do 4 rounds, too. Train your arms 2 times a week. 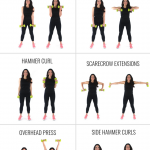 I recommend alternating this workout with one of my other arm workouts for women. Doing the same exercises over and over, causes adaptation. Your muscles ‘remember’ what you do. By switching up the exercises, you’ll get better results in less time. For the best results possible use this workout along with my fat burning programs. Abs really are made in the Kitchen! If you’re not following a complete nutrition and training program it can take longer to burn fat and see muscle tone pop. If you’re serious about getting results, check out my programs. My Fitness programs are also designed exclusively for women and help you burn fat 3 times faster. Ready to work this workout? Let’s do this! Stand with your feet shoulder-width apart while holding a pair of dumbbells by your sides. This is your start position. Curl your dumbbells upright so that your palms come close to your shoulder. Inhale as you slowly lower the weights back down to complete one rep. Repeat the same number of reps with each arm to complete one set. Stand with your feet shoulder-width apart with your dumbbells in front of you with your palms facing your body. This is your start position. Exhale and pull the weight up as far as you can, keeping your hands close to the body. Move your elbows out and up, as you pull the weight up. At the top, squeeze the back muscles and hold for a count. Then inhale and slowly lower the weight back down to the start position. Stand with your feet shoulder-width apart with a dumbbell in each hand with your elbows close to your sides, with your palms facing your body. This is your start position. Exhale and lift the weight straight up towards your shoulder until the dumbbell is at shoulder level. Hold the contracted position for a count. Tip: Keep your elbow stationary and only move your forearm. Next, inhale and slowly begin the lower back down to the start position, as if you’re about to hit a nail with a hammer but do not swing the weight. Stand with your feet shoulder-width apart. Holding dumbbells, lift your elbows up, until they are in line with your shoulders, with your knuckles facing the floor. This is your starting position. Exhale and extend the weights up and out to the side as far as you can. Inhale and return back to the start position, to complete one rep. Stand, holding your dumbbells (or barbell), with an overhand grip, slightly wider than shoulder-width apart at shoulder height. Your arms should look like a wide “W.” This is your start position. Exhale and push the weight up until arms are extended overhead. Inhale and lower down to your shoulders to complete one rep. Stand with your feet shoulder-width apart. Keep your chest up and back straight. With a dumbbell in each hand, lift arms up and out towards your shoulders, keeping your elbows close to your sides. Pause and then slowly uncurl the arms, hammering them back down to your sides, to complete 1 rep.
That’s it! Leave me a comment and let me know if you felt the burn and if you liked this workout. If there’s content you’d like to see more of, check out my connect and content request form. Once you fill out my connect and request survey I’ll start sending your content tailored to help you reach your goals. It’s free. Learn more about my story and fill out your request survey here. PS. To burn the most fat follow my fat burning fitness programs. You’ll get noticeable results in DAYS not weeks!! Guaranteed. 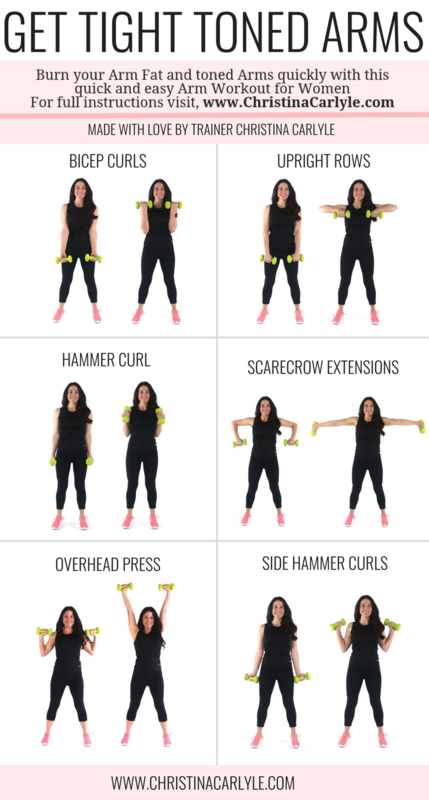 TIP: Try this workout with these arm exercises with weights. I s there one exercise for your arms that also works your back fat? How long does it usually take to see results ? That depends on your consistency and diet. The more committed and consistent you are, the faster you’ll get results. Yep! It works, if you work it. Try to train your arms twice a week and follow a meal plan for the best results. Lost a lot of weight due to dress from being in a custody battle for 2 years I’m now a new me and I want my weight tone and muscle back! You can. I recommend maxing out at 8 exercises per session though. You can mix and match the moves, too. Hi- Do you do each exercise 1 time through then repeat 2 more times for a total of 3 sets? You can do them one by one or by set. It doesn’t matter as long as you do all exercises 3 times each. Thank you so much for this. I work in a very hot place. At 60 years young I gotta keep my arms in good shape to be able to go sleeveless. I’m a metabolic magician, nutrition nerd, exercise expert, and motivation master. I makeover metabolisms to get people happy, healthy, and fit fast. I live unapologetically in yoga pants and coffee makes my world go round. If I only worked out when I felt like it, I never would… because laughing is my favorite way to burn calories, ya feel me? But hey, since you’re here I’ll show you how to get rapid results… even if you love food and have a love/hate relationship with exercise like me. Get access to exclusive free VIP-Only resources that make getting happy, healthy, and fit feel easy. Sign up to get started now. It's free. Getting fit and feeling awesome starts with a healthy metabolism. 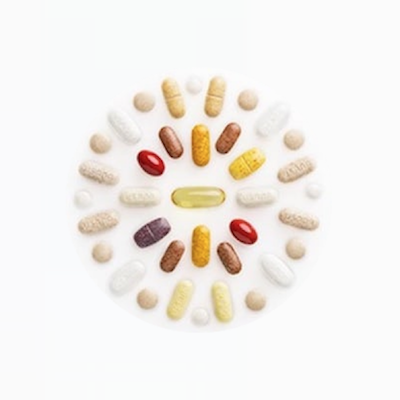 Is your metabolism healthy? Find out during this metabolic training and analysis. Enter your info to get started. Click here to confirm that you want the metabolic analysis and training emailed to you. Your info won't be shared with anyone, for any reason. Enter your info to get instant access. ARE YOU A VIP YET? AS A VIP YOU'LL GET FREE RESOURCES THAT MAKE IT EASY TO GET FIT & HEALTHY!